Our office is open from the Monday to Saturday. 9h30 - 12h30 and 14h30 to 18h. You can reach us on the +33 4 66 73 44 00, or with the from. Check-in date, number of nights. By submitting this form, I agree that the information entered will be used as part of my contact request and the commercial relationship that may result. 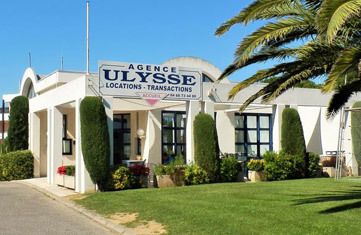 Your personal data are collected by the Residence Ulysse in the strict framework of the processing of this application. In accordance with European regulations, you have the right to access / modify / delete your personal data, on simple request via this form. Holiday rental in Le Grau du Roi, Port Camargue. Residence close to the beach with swimming pool, tennis, minimarket. Stay from two nights, open all year round. Check-in between 16h and 18h. Can be early (15h) during off-season. For checking-in after 18h or the Sunday, please inform the reception first. VISA, MasterCard, SEPA bank transfer.